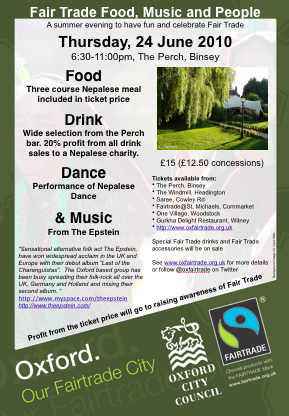 We’ll have a full three-course Nepalese meal cooked by Chitra and his team; live music from The Epstein; and performance of Nepalese dance – all within the fantastic setting of The Perch, Binsey. You can also order tickets online (booking fee applies) using a credit card here. Groups are welcome. If you’d like to help promote the event then you can download a poster here. This entry was posted on Friday, May 21st, 2010 at 6:45 pm and is filed under Events, Fairtrade City. You can follow any responses to this entry through the RSS 2.0 feed. You can leave a response, or trackback from your own site.